Why Should Schools a Have Network Time Server? Why Should Schools Have a Network Time Server? Schools are increasingly being targeted by DDoS attacks [Distributed Denial of Service] to the point where access to the internet or computer resources is completely restricted. How can schools combat this growing problem? A network time server could help to ease attacks. How do DDoS attacks bring websites, servers or networks to a standstill? Imagine boarding the last train of the day, chances are you’d be one of just a few people on the platform, you can board the train easily. Now, imagine boarding a train during rush hour. Just as you’re about to board, a crowd of commuters all try to pile through the same door at the same time, each of them jostling and vying for space. However, only a few of those commuters have a valid ticket to travel, with a right to board the train. The rest are ticket dodgers with no right to be on this train, but irrespective of the situation, the entrance to the train is overwhelmed. Before everyone can board, the train doors close leaving you and a number of other passengers on the platform. This everyday occurrence can be likened to a DDoS attack, it denies access to a website, server or network by inundating a target with requests until access is completely denied. Can a DDoS attack affect my school? Yes, you could make the case that your school is too small to become a target or you’ve got some top notch firewalls in place, but this won’t prevent an attack. Don’t be naïve in thinking that your school is not on the radar of hackers, they’re not fussed about the size or type of organisation they attack, hence the reason that attacks on schools are becoming more frequent. Unconvinced? Just ask Microsoft and Sony about how damaging DDoS attacks can be. It was Christmas 2014, a raft of Xbox One and PlayStation 4 consoles were ready to connect online. However, millions of gamers awoke on Christmas day to discover that the brand new consoles would not connect to the PlayStation Network or Xbox Live platforms. How are schools being targeted? Hackers are targeting schools in a variety of ways, one of which is flooding servers and networks with repeated requests for the time. Time synchronisation across school computers and other network devices is often managed by a free internet time server. The fundamental problem with this is that networks are left vulnerable because free internet time servers are often unsecured. A selection from the Galleon NTP Time Server range. Scenario – Let’s say your school’s computer system relies on time synchronisation, provided by a free internet time server, to update sensitive data at a set time on a set day of the week. Without warning, the system is hit by a DDoS attack, the result of which is a complete crash of the school’s network and your time critical system is shutdown. Additionally, with more and more schools making the shift to cloud-based services, which rely on the internet, a DDoS attack becomes increasingly likely. However, a dedicated NTP server for your school would reduce the risk of such security breaches occurring. A number of network time servers exist that function independently of internet connectivity, a function that reduces the risk of your school suffering a DDoS attack. Galleon’s newly launched, NTS-6002 device is one such example of a dedicated network time server available for use in schools. Galleon’s newly launched, GPS NTP time server package. As a school, you need to be aware that although they’re illegal, DDoS attacks are not going to suddenly disappear. In a worst-case scenario, an attack could leave your school unable to perform the most basic of tasks such as accessing the internet or registering new students. One way to defend against an attack is to get a network time server. They’re easy to install, with minimum disruption and they provide a safeguard for your network. Ask your school’s IT department to call Galleon Systems on 0121 608 7230. Learn more about safeguarding your school’s network and order your network time server, today. Fill in the form or call 0121 608 7230 for more information on how a Galleon Time Server can work for you. Please contact me to discuss the Galleon product range. 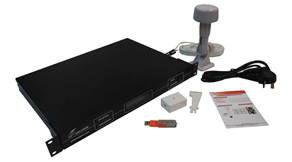 NTS-4000-GPS-R - A complete solution for synchronising the time across any computer network.